Look what arrived the other day! This box is huge! But my human says I can’t have what is inside, even though it is for me! She says I should wait until — get this — Christmas! Binga is not happy about this either. 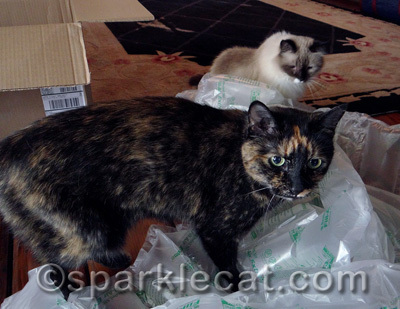 My human let Binga and Boodie play with the packing (I was not interested), but c’mon! Do you think that’s enough? I don’t! Even Boodie thinks it’s unfair! What about you — do you think this is right? I mean, it is only September! We should get whatever was in that box now! I shared about this on Facebook and most of my fans there were outraged. So I thought I would put the question to you here, in the form of a poll. 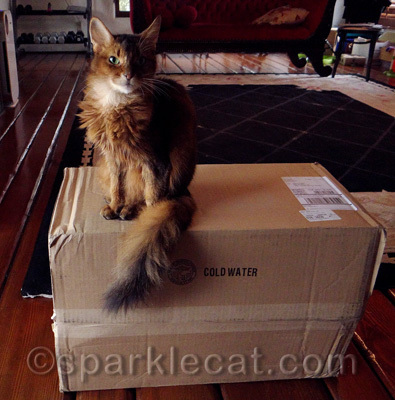 Now is your chance to tell my human she is wrong — because I bet you want to know what is in the box too! I separated the voting into species because I wanted to see specifically how you kitties or humans (or you other critters) feel. Should we get to see what was in the box now or wait until Christmas? My human did the same to me! It’s so unfair! I have to agree with Pippy from Feline Yogi on this one! OPEN IT NOW!!! PS It would only let us vote once but you would be sky high in votes is all fur kids, humans, fosters and the dog could have voted. TEAM SPARKLE! That vote os pretty conclusive I would say!!! I say that you shall have whatever is inside that box NOW , RIGHT AWAY and AT ONCE !! Now! I would go mad waiting for Christmas. Even my mum agrees. Uh, NOW. Why is this even up for discussion? There’s PLENTY of time between now and the holidays for her to buy you more presents for heaven’s sake! If you let the anticipation build for awhile you’ll like it much better. Who cares what’s in the box, it’s the box itself that’s the most fun! What’s up with that Sparkle? Put the bitey on! That is a nice box though. Sparkle, that is really cruel and unusual punishment! 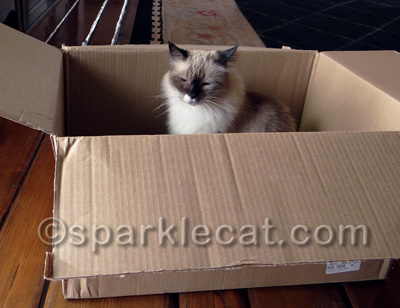 The box sure is nice…maybe you can keep that until Christmas…it’s only fair after all, if your human really does make you wait for the present. I think the mom should not be bringing boxes in the house if she doesn’t want you to open it. That is just plain mean. OPEN IT! I’ll bet its the new cat tree and it’ll be well waiting for. It’s not fair but at least you can play in the box. Sparkle we want to know what it is too. Hey! Your Mom needs to make with the presents now. She can buy you something new later. I’m glad I’m not the only one already gathering Christmas gifts! In fact, I’ve only got 2 more to go, and they’re not Vlad & Barkly’s gifts! Vlad & Barkly voted wait b/c they’ve got to wait too! No waiting! What’s up with that??? I couldn’t vote from my iPad, it said it couldn’t validate the referrer. So let’s open the package! It’s way too long until Christmas and humans tend to forget about things so to avoid your human from forgetting to give it to you, we say you should get it now! I say wait ’cause, if you open it now, you won’t have anything to open at Christmas! Well you COULD have something else but then you’ll just have MORE pressies! Either way, there is a box & packing materials in the meantime to distract you. I’d wait til Christmas. What if that’s the only present you get? Christmas will be sad. We voted for NOW because we don’t know what everyone else thinks be we want to see it now too. 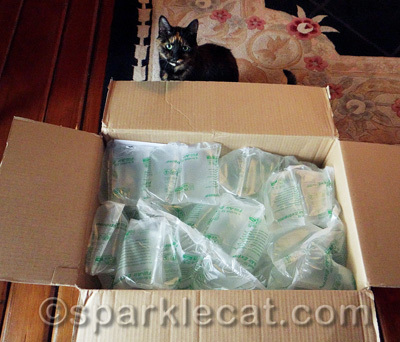 You should NEVER hafta wait when a box comes in the house, Sparkle. Unbelievable! Surely it’s obvious- you get it now and another one for Christmas. What are humans like? Yes, open it now, especially as it’s already partly open. No time like the present (if you’ll excuse the pun). That truly is really unfair. That is long long time to wait. We just wouldn’t allow that around here. Sparkle you need to train your Person better. Take care. We kitties should NEVER have to wait for gifts. And they should be OFTEN!